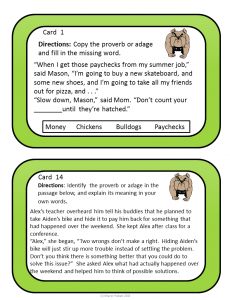 Task cards are a favorite item for teachers to stockpile. They’re so versatile and can be used over and over again. 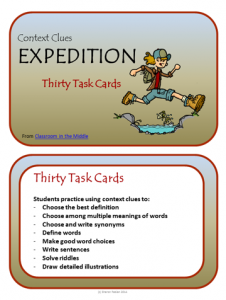 Task cards work great for a full lesson, for individual practice, or for small group activities. So it’s not a surprise that task cards are one of those things that teachers collect over the years. Adding a few new sets and rediscovering some old favorites is always fun before the start of a new year! To me, task cards are fun to create, and the “stash” of task cards in my store keeps growing. too. And with so many possibilities, my stash of ideas for new sets that I want to make seems to keep growing, too! I’m thinking that my next set will be something poetry-related, maybe figurative language vocabulary. The sets that I already have in my store range over a variety of topics. Some are for reading skills, some are for vocabulary, and I even have a set or two on writing skills. Oh, and then there’s the seasonal ones – I added a set for summer practice this year,so I now have sets for all four seasons. 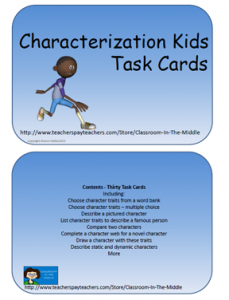 Characterization Kids has been my most popular set. It’s all about short activities that give kids practice with characterization skills in a variety of ways. 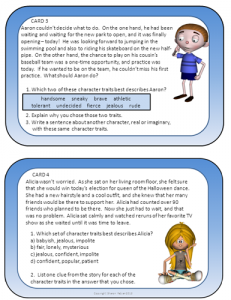 Character traits,comparing characters, static and dynamic characters-it’s all here. 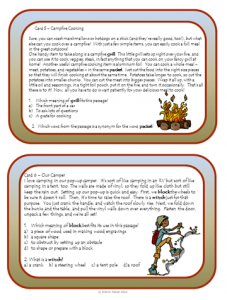 Context Clues – Expedition – Context clues many ways, includes multiple meaning words, synonyms, and riddles with a fun camping theme and graphics from one of my favorite clip artists. 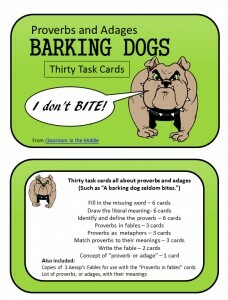 Proverbs and Adages Task Cards – Is it true that barking dogs never bite? I don’t know, but the old adage led to the choice of the silly bulldog image for these cards. It’s just one of the adages that your kids will discover with this set of cards. You can read more about any of the sets, download a preview, or see what other sets are available in here. Maybe you’ll see something that you just need to add to your own task card stash!